Hummingbird Territory – Tomato Town organically grows heirloom tomatoes in the greater Kansas City area as well as Johnson County, Leawood, Lenexa, Olathe, Shawnee, Merriam KS, Independence MO and Kansas City Missouri, KCMO. Varieties include: Cherokee Purple, Brandywine, Stupice, Carbon, Black Krim, Black Cherry, Yellow Pear, Absinthe and Aunt Ruby’s German Green. Resting on a spent sunflower. 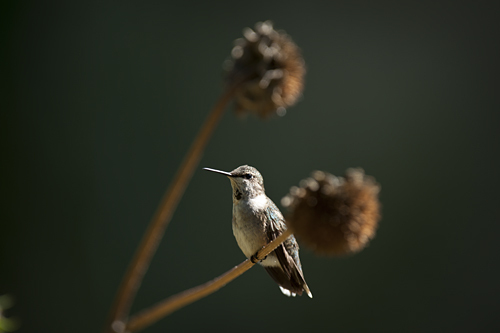 These early fall days wandering around in TomatoTown, chances are high that you’ll be buzzed by one of the many hummingbirds fueling up for their long migration. The sprightly acrobats zing around the yard vying for a chance to feed. This entry was posted on Saturday, September 8th, 2012 at 9:31 am. It is filed under Creature Feature. You can follow any responses to this entry through the RSS 2.0 feed.